Little Wonder Electric Hedge Trimmers run smooth for quiet operation, yet these lightweight, heavy-duty trimmers pack the power to easily cut stubborn growth from shrubs and hedges up to one-half-inch thick. Little Wonder Electric Hedge Trimmers feature dual reciprocating high-carbon steel blades maintain a sharp edge six to ten times longer than traditional steel and glide flawlessly for fatigue-free trimming at speeds of up to 2,700 cuts per minute. 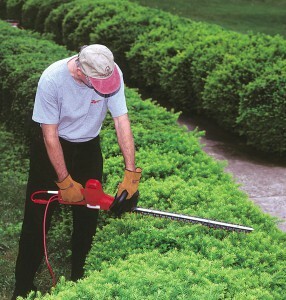 Cutting width: growth up to 1/2” thick. Notes: *All models available in 220v.